I grew up on Maier's Italian Bread, a sandwich bread so white and fluffy that you could gently poke it with a finger and leave a permanent dent. I still have fond memories of that bread, toasted and buttered, smeared with crunchy peanut butter and Smuckers strawberry preserves, or topped with delicious smoked turkey and Dijonnaise. I sneered at people in restaurants who ordered their sandwiches on whole wheat bread, figuring they were health nuts or gluttons for punishment, or both. Although I made the conversion to whole wheat bread years ago, I've been slow to embrace other whole grain carbohydrates, specifically brown rice & whole wheat pasta. I feed whole grain pasta to my kids all the time, but I rarely make it for myself. First, I had to ask myself - is it really worth it? If you compare the nutrition information on brown vs. white foods, it's not that much different, especially if you're just looking at fat and calories. But since one of my main concerns is my constantly lagging energy, I do see a valid reason to choose whole grain over refined. Whole grains take longer to digest and contain more fiber; as a result, they keep you fuller longer and help you avoid the "crash" that comes from eating refined carbs. That "crash" is probably my biggest roadblock to healthy eating - when I get that sudden ravenous, shaky feeling, any healthy intentions I had go right out the window and I'm shoving aside my yogurt and busting open the box of Snyder's pretzels. Another area where the brown stuff wins is in the vitamins and minerals. One might argue - why not just eat the white stuff and take a multi-vitamin? Well, I guess you can. Except some health experts maintain that there's no way to truly know how the body processes and absorbs naturally-occurring vitamins & minerals vs. supplements. I'm not a scientist, but my gut tells me that it's probably better to eat something in its natural form than to eat something that's been stripped of its nutrients by machines and then injected with a weakened form of those same nutrients. My personal answer to whether or not it's worth it to go for the grains is this: Sometimes. I don't foresee a time in my near future where I'll be ordering my Thai curry with brown rice, or asking for my penne, sausage & vodka sauce to be made with whole grain pasta. But I do feel that it's important that the majority of my carbohydrate intake be whole grain. I've even found some instances where whole grains can be substituted for refined grains without sacrificing flavor at all. If you're having trouble finding true enjoyment in whole grains, start with the sweet stuff. Whole grain cereals, muffins, and snack bars taste pretty good. You can also make french toast with whole grain bread (my kids' favorite). When it comes to snack foods, Triscuits is a good whole grain option, as are many other crackers. I've found that whole grain pasta seems to work best in dishes which maximize earthy flavors, such as those containing onions and mushrooms. For example, I made this recipe from Rachel Ray, which worked well. And while I tend to go for the white stuff when I use tomato-based sauces, my kids gobble up whole wheat rotini, marinara and meatballs like it's the best thing ever. As for the rice, I can't quite bring myself to pair brown rice with curries or other spicy foods. But I've had success with this chicken salad recipe. I have also used brown rice to make stuffed peppers with tasty results. I've been meaning to pair it with swedish meatballs because I think the flavors would complement each other, but I haven't had time to try it out yet. So the answer to whether to eat brown or white doesn't need to be black or white. I think as long as you make sure a healthy portion of your carbs are brown, there's room to enjoy the white stuff too. I can't help but LOVE white bread. 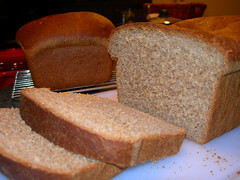 I do stay away from the cheap-chemically-enhanced-and-bleached crap though - I love buttermilk bread and sourdough. But I've gotten hooked on certain brands of whole grain or whole wheat - Pepperidge Farms has a great variety, and we just tried Archer Farms from Target - YUM - and no HFCS either. I made whole-grain pasta last week, in the form of 3-cheese tortellini with homemade sauce. B loved it, but I wasn't sure about it. I already like brown rice though so that hasn't been a hard transition to make. Jen, I definitely love sourdough, too. I will have to check out the Archer Farms bread...Archer Farms is slowly becoming my favorite food brand! I had to cut out all bread, for the most part. Mike and I try to eat as many whole grains or whole wheat foods as much as possible, but we still (Mike mostly) stick to the "white pasta" because of the taste. I'm trying to change his ways, but haven't won him over yet to the whole grain pasta. I have tried the new Sandwich thin rolls (100 calories) in wheat (Pepperidge Farms and Arnold make them) and have found that makes a good sandwich or burger without the "big" rolls. I should give you my recipe my pineapple shrimp fried rice recipe we always make it with brown rice its so good. Thanks for the recipes, kelly! I will have to try them out - although I'll probably skip the pineapple and add the jalapeno. I've always had issues with fruits in savory dishes...pineapple on pizza just leaves me scratching my head, as does a waldorf salad. And maybe I just haven't eaten enough brown rice to develop a taste for it. I'll keep trying! I am not one for pineapple pizza either but the rice was really good that way. Try it the way you like it... I probably wouldn't have tried it either but someone had not made it for me first. My aunt made it and she used pre-made brown rice that was in freezer section at costco.. but that was in california. I don't think they sell it here. But I do love fruit in salads not waldorf with mayo but apples, crasins, strawberries in salad YUM!